Colours In The Storm is the musical by Jim Betts about the life – and mysterious death – of iconic Canadian painter, Tom Thomson. More a play with songs than a traditional musical, the show follows Thomson’s development as a painter from his arrival in Algonquin Park in 1912 to his death there in Canoe Lake in 1917. 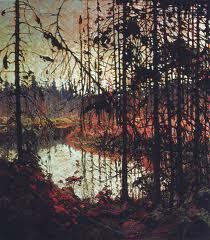 His 1915 painting “Northern River” inspired what has become the theme song of Colours In The Storm. You can hear the song here, Northern River, sung by the composer, Jim Betts. There will eventually be links to other songs from the show on “The Songs” page. Eventually, too, there will be further links to the show’s story, script, songs, paintings, truth, lies, gossip, people, and production rights. Thanks for your interest in Colours In The Storm.